Kahlii Item Builds Guide for Arena of Valor (AoV). Each build is geared toward a different play style, so choose one that fits your personal preference. These items are necessary in order to play Kahlii optimally. Only diverge from a core item if you are a very experienced player and/or you have a very good reason for doing so. Orb of the Magi Orb of the Magi gives mages a very safe early game by regularly topping off their health and mana. The stats that it offers shouldn’t be snuffed either, building over time to provide large amounts of ability power, HP, and mana. Frosty’s Revenge Frosty’s Revenge’s slow synergizes well with Eternal Blame, increasing how much heroes trapped inside are slowed. It additionally traps enemies barraged by Grievance, making it all the harder for them to escape from subsequent projectiles. The ability power and movement speed bonuses that the item offers go well with Kahlii’s kit as well. Boomstick Boomstick not only adds considerable damage to Kahlii’s abilities, but also adds its wide explosion to Kahlii’s magical normal attacks. 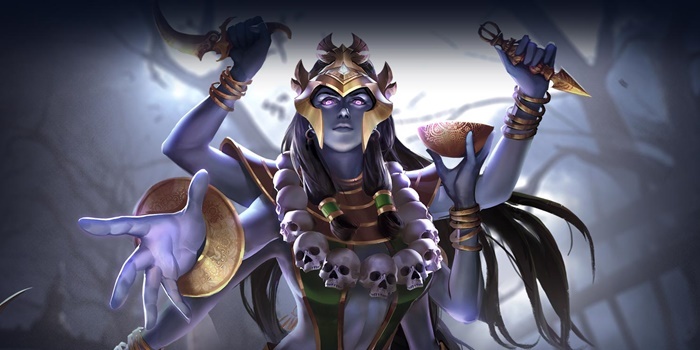 The ghost of vengeance will be able to deal out damage over a large area with her normal attacks alone, greatly increasing the speed at which she can clear minion waves as well as improving her presence in team fights. Hecate’s Diadem Hecate’s Diadem is a must for most damaging mages, offering the potential for more ability power than any other item in the game. The item increases in power with each additional ability power item that Kahlii buys, so is a must when going for the highest ability power possible. Rhea’s Blessing Rather weak in terms of health, Rhea’s Blessing helps Kahlii out of sticky situations with the shield that it provides. The magic life steal the item offers is additionally useful, helping Kahlii recover from trades as she pushes the lane. Zweihander Having a unique reliance on magic normal attacks for damage, Zweihander can be a decent pick up for Kahlii. It both increases the attack speed and potency of her normal attacks while also granting a nice bit of ability power and movement speed. Enchanted Kicks Enchanted Kicks increases her ability power and magic piercing, stats that Kahlii greatly needs. Building this early will allow you to deal more damage against heroes with your abilities and auto attacks. Sonic Boots Get this boots upgrade if the enemy has a lot of physical damage in their composition. You can also swap this mid-game if the enemy marksman is very fed and your team needs to adjust. Gilded Greaves Gilded Greaves is the optimal boots upgrade if you want to lessen the duration of crowd control aimed your way. It also gives out magic resist which can be very helpful against bursty mages. A rather straight forward build for Kahlii, this focusing on ramping up her damage. Boomstick, Holy of Holies, and Hecate’s Diadem will pump up her ability power quite a bit, causing her abilities to rip through her enemies. The only item that could be replaced for another with more ability power is Frosty’s Revenge. It, however, brings it’s own benefits that cannot be ignored. The slow that Frosty’s Revenge provides will make Eternal Blame much more effective as well as make Grievance much easier to land. A more defensive build for a Kahlii who constantly finds herself at the business end of her enemies’ weapons. Each ability power granting item additionally grants some defensive stats to make the spirit much harder to banish. Berith’s Agony makes up a bit for the loss of Hecate’s Diadem. Her spells deal damage through a number of quick shots, so the on-hit effect will get many chances to go off. Now, I know what you’re thinking, and you’re right. Hear me out. I’m not going to stand here and tell you that this is the best build in all of creation. What it is, thought, is really fun to play. Zweihander, Frosty’s Revenge, Slikk’s Sting, Devil’s Handshake, and Kahlii’s Incorporeal all grant movement speed bonuses, causing her to zip around the battlefield at an amazing 650 base movement speed. This of course is closer to 700 should you get cheeky and buy Hermes’ Select. While not heavy on ability power, this build will still allow her normal attacks to hit for around 1000 damage normally, closer to 1300 when they crit. Devil’s Handshake procs twice each time she normally attacks as well, allowing her to hit a very high attack speed very quickly. In addition, her abilities are not completely disregarded here. While they certainly won’t be hitting as hard as if she were building as a “normal” mage, Eternal Blame and Grievance will still have a bit of bite to them when needing to slow down or pick off enemies. First build: the fourth item is not Boomstick and the fifth item is not Hecate’s Diadem! Second build: the fifth item is not Rhea’s Blessing! Which fits Kahlii more: Boomstick or Staff of Nuul? Thank you for this! I have corrected the mistakes you have kindly pointed out. As to your question, it depends on when you are building the item and the enemy’s current builds. Not much magic defense/early game? Boomstick. Lots of magic defense/late game? Staff of Nuul.